RAYMOND WEIL, luxury Swiss watchmaker presented international superstar Pharrell Williams with the RAYMOND WEIL International Artist Award at the annual Nordoff Robbins O2 Silver Clef event, held at The Hilton Hotel, Park Lane, London, on July 4th. 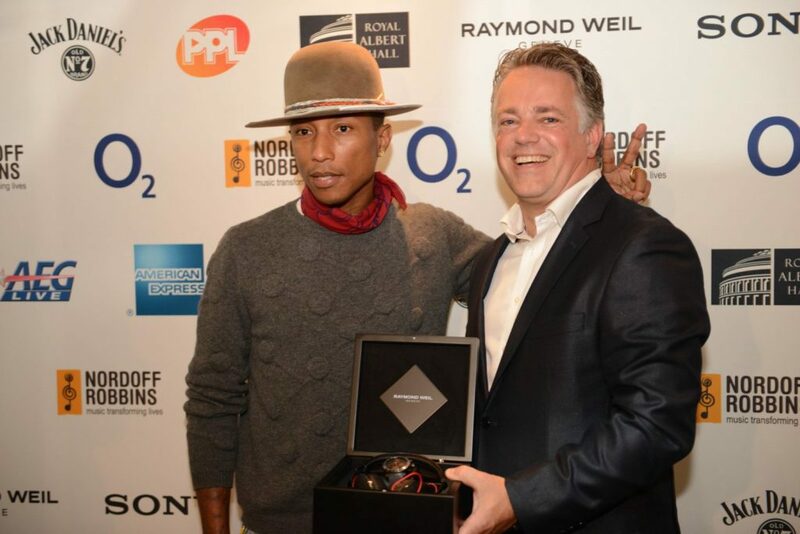 Pharrell was on-hand to receive in person the award from RAYMOND WEIL’s UK Brand Director Craig Leach at the star-studded event that was attended by some of the biggest names in the music business: Jimmy Page, Sir Tom Jones, Black Sabbath, Chas & Dave, Paloma Faith, Giorgio Morodor, Laura Mvula, Gaby Roslin and Gareth Malone. Having just reached Number One with his critically acclaimed new album, ‘G I R L’, Pharrell Williams has sold over 5 million copies of the single ‘Happy’ which was the first taken from the album; it also featured on the ‘Despicable Me’ soundtrack and was nominated for an Oscar this year. He has recently collaborated with Daft Punk on the massive Number one ‘Get Lucky’ and with Robin Thicke on the biggest selling single of 2013, ‘Blurred Lines’. The multi Grammy Award winner, with a career that has spanned over two decades, built global support throughout the nineties and naughties, producing chart toppers Britney Spears’ ‘I’m A Slave For You’ and Nelly’s ‘Hot In Here’. Pharrell then featured in Snoop Dogg’s ‘Drop It Like It’s Hot’ which was named Billboard’s ‘Song of the Decade’ in 2009 – just a few of his vast collaborations and achievements. The O2 Silver Clef Awards have collaborated with artists from all areas of the music industry since 1976, to raise funds for Nordoff Robbins’ music therapy work. This year, the O2 Silver Clefs will continue to shine as the pinnacle event in the Nordoff Robbins fundraising calendar and a highlight of the year for the music industry, with some of the biggest names coming together for this special event. Music charity Nordoff Robbins uses music to transform the lives of people of all ages all over the UK. Supported heavily by the music industry, where they are the charity of choice at the BRITs and the MITs, to date, the O2 Silver Clef Awards, now in its 39th year, has raised over £8 million for Nordoff Robbins since 1976. Previous reciprocates of the RAYMOND WEIL International Artist Award have included: Vampire Weekend, Michael Bublé, Swedish House Mafia, Kelis, Meatloaf, John Legend, Foo Fighters, Bob Geldof, Bon Jovi and Kylie Minogue to name a few.